Hi everyone! Today, I'm pretty excited to share with you a new card I worked on a couple of weeks back. Today's challenge was tough for me because I've never add any numbers to my cards before so I was quite stuck. But I saw those cute number in the Milo's ABC stamp set and I thought, "I'll just use it as a background". I've embossed it on a watercolour paper because I was adding some watercolour wash in the middle of the card. I've chosen to embossed it with white because I only wanted the numbers in the middle to stand out and gives a fading out effect. 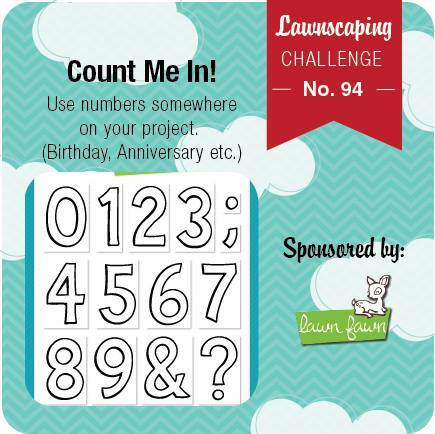 Head over to Lawnscaping Challenge to enter your own card using numbers in your card to win a prize sponsored by Lawn Fawn! Don't forget to subscribe to the Lawnscaping Facebook page to see more inspirations from the team. What an absolutely darling card!!! I love that background!! The water coloring over the Headin bus numbers is such a delicate and beautiful addition! And I totally love any cluster of balloons! Love this!